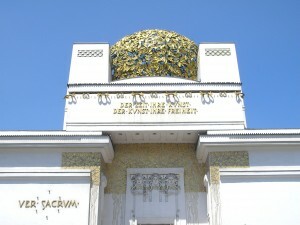 The Vienna Secession was part of a wider Secession movement with branches in Munich and Berlin. It was not solely an architectural movement but included visual artists. While anti-academic and anti-historicist, plurality was encouraged; there was no specific artistic or architectural style. The group were influential for their development of a new national style rejecting historicism. 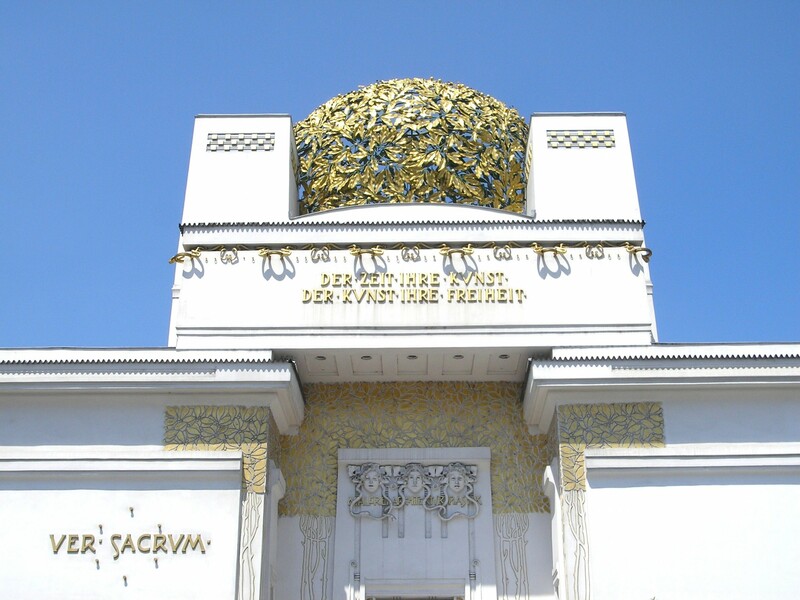 The Vienna Secession was founded in 1897 by Gustav Klimt, Joseph Maria Olbrich, and Josef Hoffman. Otto Wagner joined them few years later. Contemporary Vienna was reacting to the Beaux-Arts classicism used in the construction of the municipal buildings on the Ringstrasse in the period 1871-1891, believed by many architects to fail to represent Vienna as a growing modern metropolis. Influenced by Arts and Crafts, particularly the work of Charles Rennie Mackintosh, the Secessionists rejected historicism and embraced geometry and abstraction in architecture. Described as the German branch of Art Nouveau, they were also developing the Jugendstil decorative style with curvilinear, organic ornamental designs. The ideas of the group were disseminated through their magazine ‘Ver Sacrum’ (1898 -1903), celebrating youth and promoting a rebirth in Viennese visual culture. Figure 1. 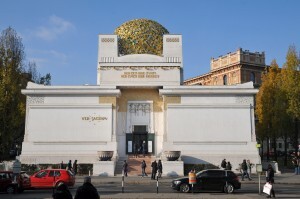 Secession Exhibition Building, Joseph Maria Olbrich, 1897-8, Vienna, Austria. Credit: Böhringer Friedrich. Source: wikimedia commons. Accessed 24 November 2015. As Ludwig Münz and Gustave Künstler assert, ‘In the battle for the new art, handicrafts and architecture came to the fore.’ This idea is epitomised by the Secession Exhibition Building, Joseph Maria Olbrich (1897-8) [Fig.1]. It was built as an exhibition space, so the interior is very flexible. It is on a Greek cross plan. Four pylons support a gilded openwork laurel wreath dome [Fig.2]. The plan and the forms embrace pure geometry. Ornamentation is extensive; flat stylised organic forms. The construction is brick with iron reinforcements, the surfaces covered in plaster and whitewashed. The inscription above the entrance reads ‘Der Zeit ihre Kunst / Der Kunst ihre Freiheit’, meaning ‘to every age its art, every art its freedom’, emphasising the desire to form a representative artistic language. Figure 2. Detail of Secession Exhibition Building, Joseph Maria Olbrich, 1897-8, Vienna, Austria. Credit: Gryffindor. Source: wikimedia commons. Accessed 24 November 2015. Leslie Topp argues that the design of this building is concerned with “truth”. According to Topp there are two different kinds of truth: rationality, and ‘a higher, metaphysical truth derived from subjective artistic inspiration.’ Olbrich published a statement in the journal ‘Der Architekt’ in 1899 after the Secessionst Exhibition Building was finished. “It grew up in six months, hand in hand with the construction; today the form has solidified.” This quotation exemplifies Olbrich’s emphasis on the building as an organic, living thing. Therefore, Topp argues this building embodies truth in a spiritual sense. This idea of a ‘higher, inner truth’ was something that linked the Secessionist movement, even if they were not united in one specific artistic architectural style. Their Darmstadt artist colony in 1901 had a quasi-religious ceremony in which they embraced the mystical ‘sign’, ‘Das Zeichen’, as carrying truth. The contemporary reception of the Secession Exhibition Building was often critical. Adolf Loos, a contemporary Viennese architect, disliked the Secessionists, especially Olbrich, as he objected to their use of ornament. The search for an appropriate architectural form for their context troubled Viennese architects but they failed to reach a consensus. As the movement progressed, architects became increasingly interested in planar and classical forms. Otto Wagner in particular was also key in developing new typologies, for example the Austrian Postal Savings Bank (1904-06) which manipulated reinforced concrete construction in a revolutionary way. 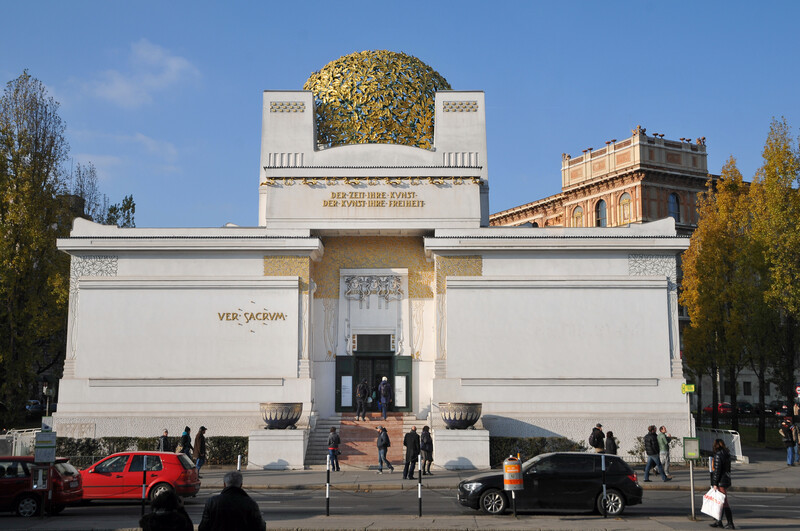 The Vienna Secession movement were revolutionary in their rejection of historicism and combined an interest in modernity and symbolist notions of ‘truth’ that proved influential on later architects. Leslie Topp, Architecture and truth in fin-de-siècle Vienna (Cambridge, UK ; New York : Cambridge University Press, 2004), 30. Victoria Charles and Klaus H. Carl, The Viennese Secession (New York : Parkstone Press International, c2011), 171. Ludwig Münz and Gustave Künstler, Adolf Loos, pioneer of modern architecture, trans. Harold Meek (London: Thames and Hudson, 1966), 30. Topp, Architecture and truth, 45.